What can I say, I absolutely loved this book. I really enjoyed the realistic way the author portrayed the characters, even though one is quite enhanced and not so human anymore. It's action, adventure with love mixed in. It was so interesting watching as Mari learned more about Heron and just what he was capable and this whole world outside of the one she knew. The plot was incredibly interesting as well. I couldn't put it down as soon as we find that Mari and Heron's mission was a complete mess up (and that's right at the beginning). The secondary characters are fun and help move the story along, not slow it down or taking away from the hero or heroine. 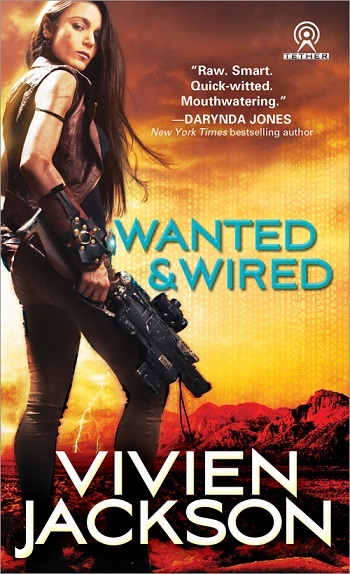 Reviewers on the Wicked Reads Review Team were provided a free copy of Wanted & Wired (Tether #1) by Vivien Jackson to read and review.